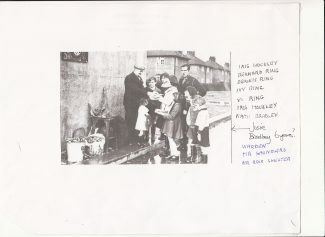 This is a photo of children getting shrapnel from the warden in Feenan Highway. A few names were identified at the Down Memory Lane on 8th September for the website. So thank you to you if you put some names to faces for us! 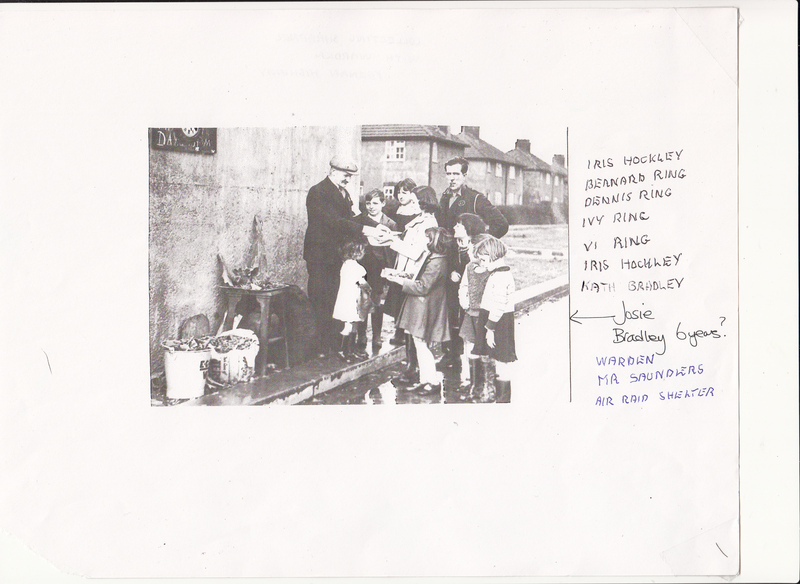 There is Iris Hockley, Bernard Ring, Dennis ring, Ivy Ring, Vi Ring, Kath Bradley, Joise Bradley (age 6) and the warden is Mr. Saunders from the air raid shelter. Any other names you can add for us? Can you tell us what children would do with the shrapnel please?? Shrapnel rained down on your shelter in a raid, and was a much sought after item, it was avidly collected, prized bits were those with German words on it. Adults were only interested in its scrap value, the Police, or Home Guard tried to stop the pilfering of downed aircraft, as the War Office could learn much about the enemie’s technology from crash sites.